History: Often credited for introducing bhangra and British Asian music to North American audiences, DJ Rekha is a producer, activist, and musician. Named her one of the most influential South Asians in the United States by Newsweek, DJ Rekha was proclaimed by “one of the ten women of downtown music” by the New York Times Magazine. From the 1997 launch of Basement Bhangra, a monthly party held at New York City’s SOBs, to Mutiny, which she co-founded with filmmaker, DJ, and MIT professor Vivek Bald, DJ Rekha has been instrumental in establishing a South Asian music scene in the United States. With gigs in cities around the world including New York, London, Mumbai, Toronto, New Delhi, and Washington D.C., she has established herself professionally in South Asia and its diaspora, and has been featured at the Brooklyn Museum’s First Saturdays, Bronx Museums Bounce nights, Soundlab, P.S. 1’s Warm Up, and Central Park’s Summerstage concert series, among other venues. In addition, she has appeared in several publications including, the New York Times, Village Voice, Times of India, and Billboard Magazine.Soon after she was born, Rekha’s family moved from the United Kingdom to India, after which they settled in Long Island, New York. While a student at Queens College, Rekha began her career as a DJ during a stint at a community radio station. Her commitment to issues of social justice and gender equality led her to become involved with SAKHI for South Asian Women. She currently serves on the board of Breakthrough, a media and human rights organization, and Pop and Politics, and is committed to exploring the intersections between activism and cultural production. Sources: Asian/Pacific/American Institute at New York University. 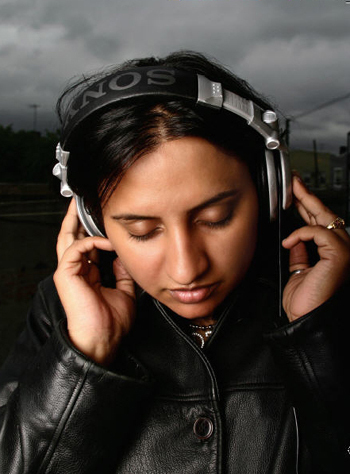 “Artist-in-Residence – DJ Rekha.” Accessed February 2, 2015. http://bit.ly/1zvLRfi. Malhotra, Rekha. Conversation with Amita Manghnani and Nancy Ng Tam. Brooklyn, NY, February 16, 2010. Sangament. “DJ Rekha – Biography.” Accessed February 2, 2015. http://www.sangament.com/press/. Summary: The DJ Rekha Papers contain files on marketing, publicity, events and programming, artist biographies, and administration. The bulk of the collection consists of 14.0 linear feet of marketing materials from 1998-2010, which include flyers from Basement Bhangra, Bollywood Disco, and other events at which DJ Rekha was featured. Within these materials are files relating to Sangament produced events and shows. Publicity files occupy 5.0 linear feet and contain magazines (e.g. Vibe, Timeout, Spin), newspaper articles, and other press clippings featuring interviews with DJ Rekha and reviews of her 2007 album. Bios of artists (with some of whom she has collaborated), contracts (for the various series that she produces), marketing data, and film scripts that are often sent to her, are stored in file cabinets that measure 8.0 linear feet. 3.0 linear feet of administrative files include tax information, vendor contracts, and personnel files. Event related files include 1.0 linear feet of photographs, as well as records from shows which detail attendance and revenue generated. The electronic files in the collection consist of three external hard drives, on which backups of digital flyer files, videos, and visuals for shows are stored.